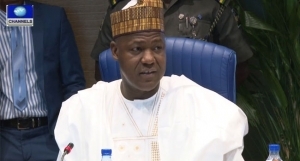 The Speaker of the House of Representatives in Nigeria, Mr Yakubu Dogara, has asked citizens to be patient and have unwavering confidence in the future of the nation’s economy which is in recession. He reassured them that the Federal Government would find solutions to the current economic recession. Nigeria’s economy had officially slipped into recession few weeks, after a report by the National Bureau of Statistics showed that the nation’s Gross Domestic Product contracted. According to the report, the decline of 2.06% in the second quarter of 2016 has caused the Naira to get weaker while lower oil prices dragged the oil sector down. The output shrunk by 0.36 in the first quarter. This growth was lower than the rate recorded in the second quarter of 2015 by 2.44% points. Mr Dogara made the call in Abeokuta, the Ogun State capital on Friday after a meeting with the Ogun State Governor, Mr Ibikunle Amosun, at the Government House in the state’s capital. Reacting to the state of emergency on the economy by the Nigeria Governors Forum, the Speaker said that the forum was entitled to its opinion. He told reporters that the members of the House of Representatives would soon come out with their own views on the economy. Few days ago, the President of the Senate and the leader of the National Assembly, Senator Bukola Saraki, had assured Nigerians that the upper legislative chamber would continue to work towards ensuring that things get better for Nigerians. Senator Bukola Saraki made the promise while addressing reporters after he joined President Muhammadu Buhari at the Presidential Villa, in Abuja, to observe Jumat service on September 9. He appealed to Nigerians to bear with the administration, as it strives to bring the country out of the current economic recession. “We will continue to appeal to Nigerians to bear. We know we are all going through difficult times. “In every country, people go through challenges. But with prayers and support, we will overcome it.